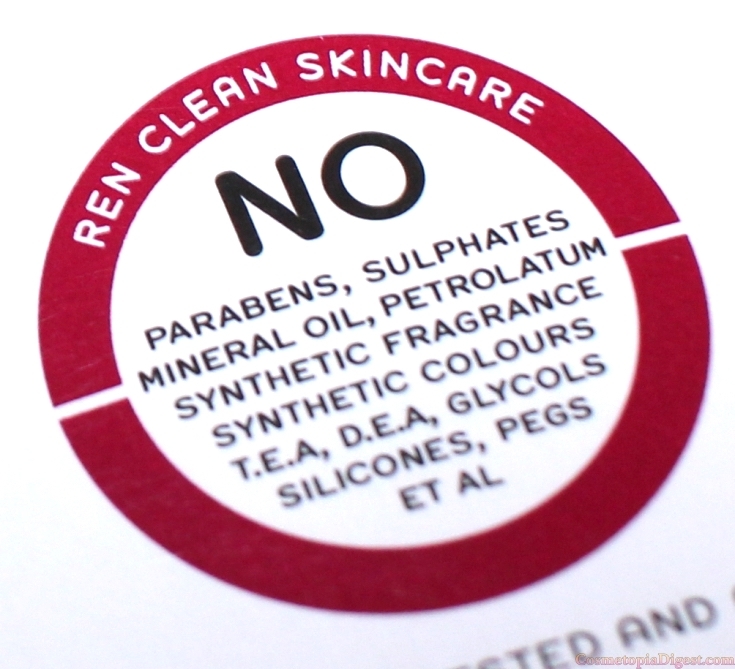 Clean skincare is British beauty brand REN's USP. I haven't come across a single REN product I didn't love, from their eye cream to the ClearCalm Clay Cleanser. 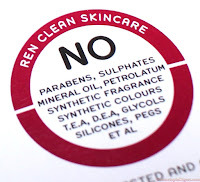 REN products are always free of parabens, sulphates, silicones, PEGs, TEA, DEA, glycols, mineral oil, petrolatum, synthetic fragrance and artificial colours. Nor are they tested on animals. 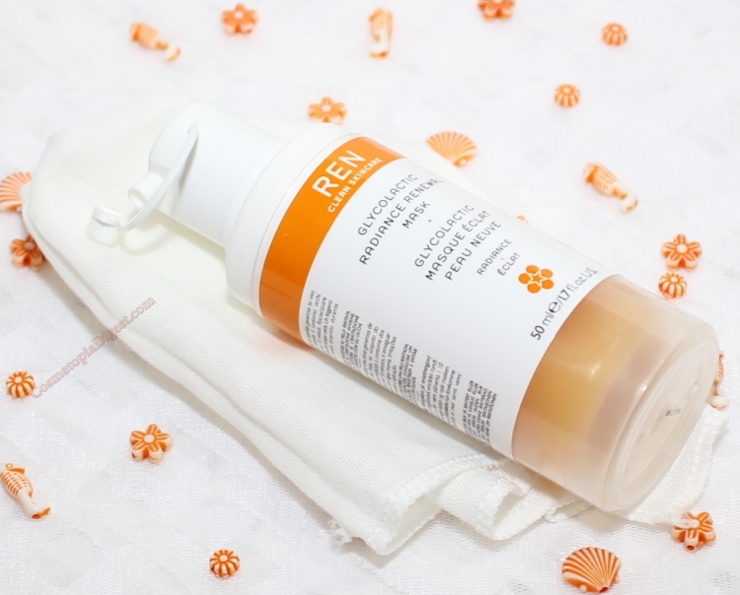 You must have seen samples of the REN Glycolactic Radiance Renewal Mask in some of my empties posts. It is a "potent bio-active peel mask designed to renew the complexion, reduce fine lines and dramatically improve skintone." Scroll down for more on the REN Glycolactic Radiance Renewal Mask. The mask comes in a vacuum-filled bottle with a pump dispenser - hurrah! This itself makes it a winner. WHY do most masks come in jars, and make you have to hunt around for a spatula, and expose the whole product to the air/elements? The pump dispenser ensures that the product is not exposed at all, and even comes with a little cap for the nozzle. Also included in the box is a washcloth, to wipe off the mask before rinsing the face. Glycolic Acid (6.5%) - extracted from pineapple. Lactic Acid - from passion fruit. Citric Acid - from lemon. Tartaric Acid - from grapes. In addition, you also have omega 3 and 7 from arctic blackcurrant, and papain from Mexican papaya. The former prevents scarring while the latter reduces inflammation. The mask is cruelty-free, gluten-free, and suitable for vegans. So what does the REN Glycolactic Radiance Renewal Mask do? The acids in the mask serve as non-abrasive exfoliants, making this an ideal home peel. Dead cells are lifted off (glycolic acid dissolves the binding between them) and pores are unclogged, as a result. It also gets rid of those pesky flakes that result from dry weather. It works for all skin types and ages, and is especially good for use in winter, when you want to remove that dull pallor and give your skin a nice healthy glow. The mask smells citrus-y. You can get the fresh tangerine-clementine-satsuma smell as soon as you open the bottle. It isn't unpleasantly strong, but fresh-fruity, if you get my drift. And the fragrance is natural. 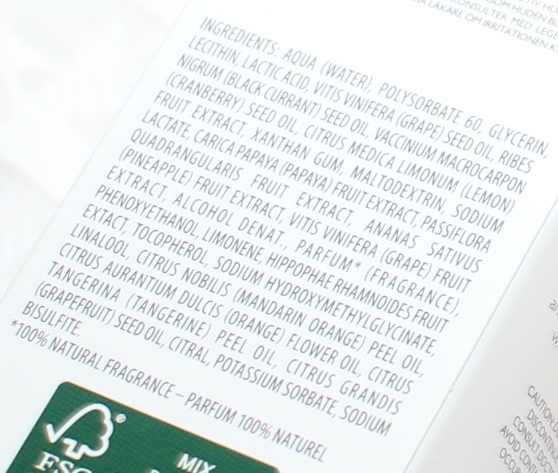 REN products do not contain synthetic fragrance. The texture is a bit tacky - keep your hair off the face - and, despite the tangerine hue to the product, the product looks clear on my skin. I use this mask once a week, as directed - a thin layer on the face; the exact quantity dispensed in one pump. The instructions suggest leaving it on for 10 minutes, but I admit I leave it on for longer because my skin is used to acids. There is a nice tingling and warmth from all the acid and my face is a tad red - not violently so - when I wipe the mask off. The redness is replaced by a lovely glow when I rinse my face. It has helped push off those nasty l'il bumps beneath the skin on my chin, and the persistent closed comedones on my forehead. Once done, I follow with essence-serum-facial oil-moisturiser-sleeping pack or whatever my skincare routine rotation is at the time. Go here to check out my 10-step skincare routine. If you are new to chemical exfoliation, this might feel a bit strong, since there is a bouquet of acids. Since last December when I had that horrendous breakout episode, I've built up my skin's tolerance nicely, so I enjoy the tingling, which shows the acids are doing their job. 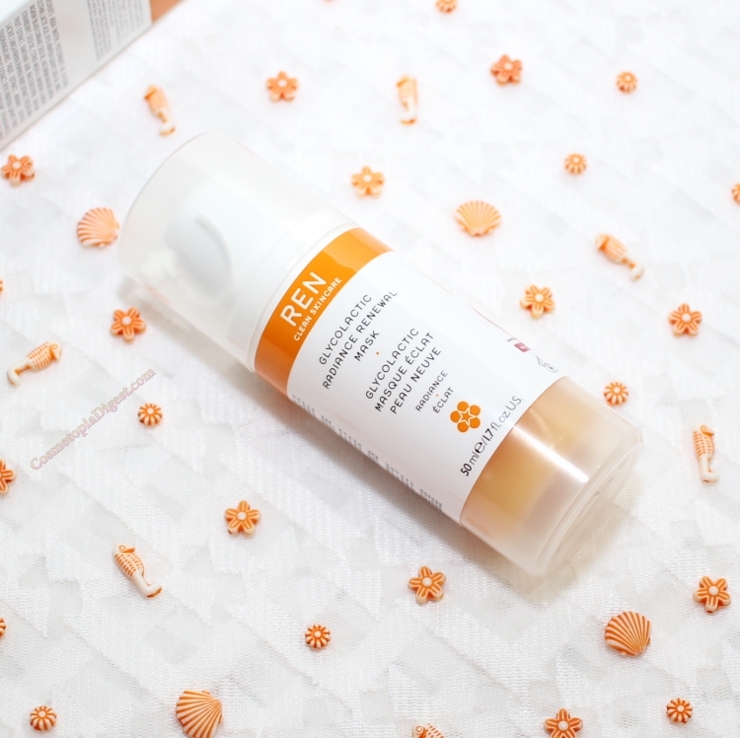 REN Glycolactic Radiance Renewal Mask is my favourite glycolic mask; you've seen the number of times it has turned up in my monthly Empties' posts. I especially reach for it if I have to go somewhere special the following day, and it helps my makeup go on easier in the morning. If you are looking for a quick weekly chemical exfoliant to, as REN says, get rid of the "floatsam and jetsam" from the face, this is a great, clean choice, and a pre-emptive investment for the stressful Holiday season. REN Glycolactic Radiance Renewal Mask costs £14 for a 20ml tube, and £32 for a 50ml bottle. The latter should last about a year, since you only need a little. A 5ml tube lasts about five weeks for me, when used weekly. To buy, go here - they ship worldwide. Go here for the smaller tube (also ships worldwide). If you are in the US, Space.NK sells REN Glycolactic Radiance Renewal Masks here. Do you use acids for exfoliation, or do you prefer physical exfoliants? Tell me in the Disqus comments widget below.